A Belgian police officer controls the access to Belgian international airport of Zaventem airport, which is still not operating, more than a week after the attacks in Brussels metro and the airport, in Zaventem, Belgium, April 1, 2016. A Belgian national was charged Saturday with terrorist activities in the investigation of a foiled attack plot. French and Belgian authorities apprehended the suspect Thursday and have identified him only as "Y.A." He is reported to be in his early to mid-30s. Prosecutors say he is linked to the case of Reda Kriket who was arrested near Paris last week and is suspected of plotting a violent attack. No specific target was identified for the attack, but authorities say a cache of weapons was found in Kriket's home. On Thursday, Belgian prosecutors said the top suspect in the November terrorist attack on Paris can be extradited to France. French Justice Minister Jean-Jacques Urvoas said Thursday he expects Salah Abdeslam to be sent to Paris within 10 days. Abdeslam's lawyer, Cedric Moisse, said his client agrees to be extradited. "Abdeslam wants to make it known that he wants to cooperate with the French authorities. These are the words he wants to make known." Another one of his lawyers said after his March 18 arrest that Abdeslam would fight extradition to France. It is unclear why he changed his mind. Abdeslam is accused of helping plan the November 13 terror attacks in Paris that killed 130 people at multiple locations. He allegedly rented rooms for the suicide bombers and bought explosives. After four months on the run, police found him in Brussels. During a raid on another dwelling, they had uncovered evidence that he was hiding out in Brussels. 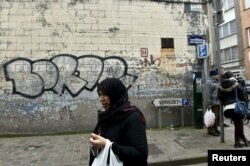 A woman passes close to the house where Salah Abdeslam, the most-wanted fugitive from November's Paris attacks, was arrested on March 18 after a shootout with polic in the Brussels district of Molenbeek, March 19, 2016. Investigators also say Abdeslam is linked to Khalid and Ibrahim el Bakraoui, the brothers who took part in last week's suicide bombings in Brussels that killed 32 people. People leave the scene of explosions at Zaventem airport near Brussels, Belgium, March 22, 2016.